Happy Birthday Dear N, I'm wearing this top for celebrating your birthday, because I know you would like it. 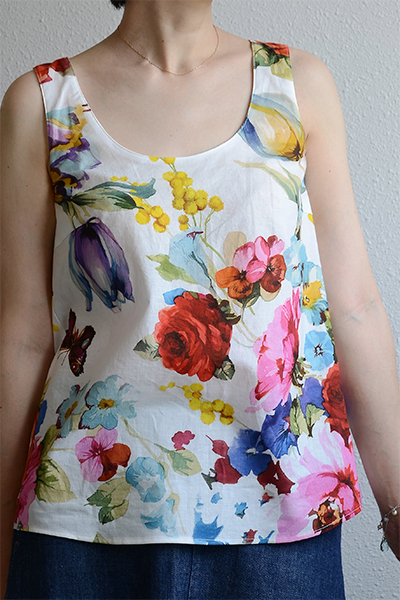 I made another Tiny Pocket Tank in a floral print. I think it's lovely. Great for summer. 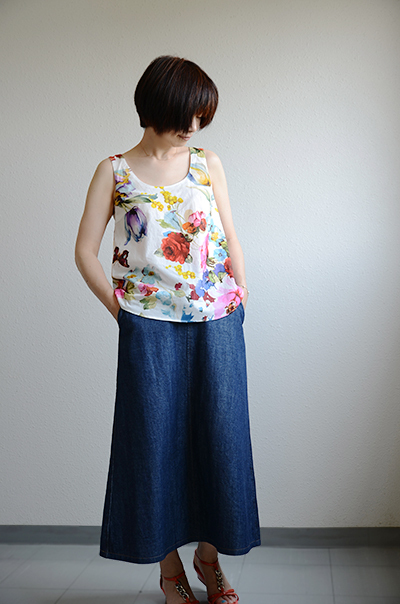 Today I am unusually posting about my sewing process of my creations (what a lazy sewist blogger I am...) I was initially thinking I'd just be silent about the pattern alteration that I made to my new and floral Tiny Pocket Tank as usual, but I changed my mind. For making a new tank, I wanted to release the horizontal creases of pulling which had been seen just above my busts of the first tank, and thought that some of you may like to know what I'd do in such case, as it seemed there were some people who had similar creases in their tanks as mine. I think it was not the size (because the highest point of my chests were siting in the first tank top without discomfort, though I noticed that I would better use one larger size for the next try for other reason), but it was the shape that asked some alteration to the pattern. 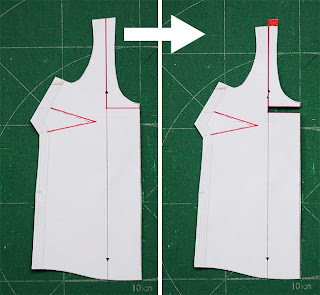 Starting like an expert who can tell something valuable about pattern alterations, I have to confess that I cannot be sure whether my way is the decent way or not, because I only have some books and an internet access but I've never attended any sewing class nor learnt sewing systematically. What I know is it's working to my body. And I am one of those who don't mind fair amount of humps and bumps including creases in the garments generally (because they're a part of your lovely character!) So, never cut your fabric before checking and simulating even if you're having the same issue in your tank, please! 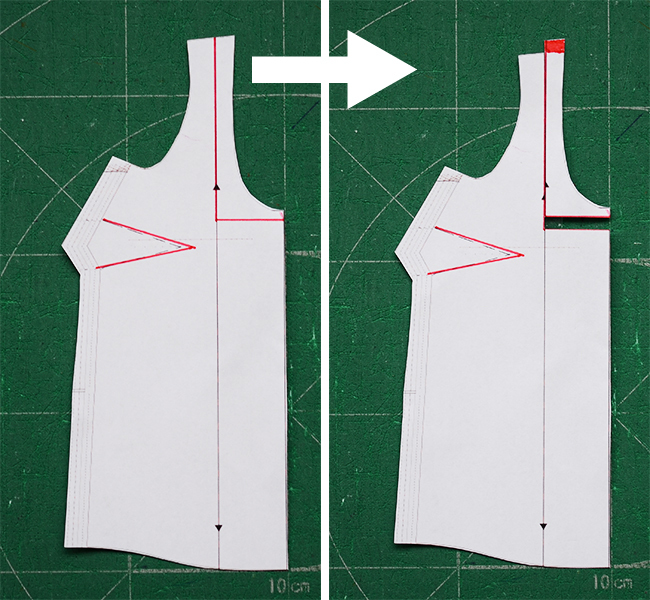 In the case of my tank, changing the length and angle of neckline affects the creases above the top bust. 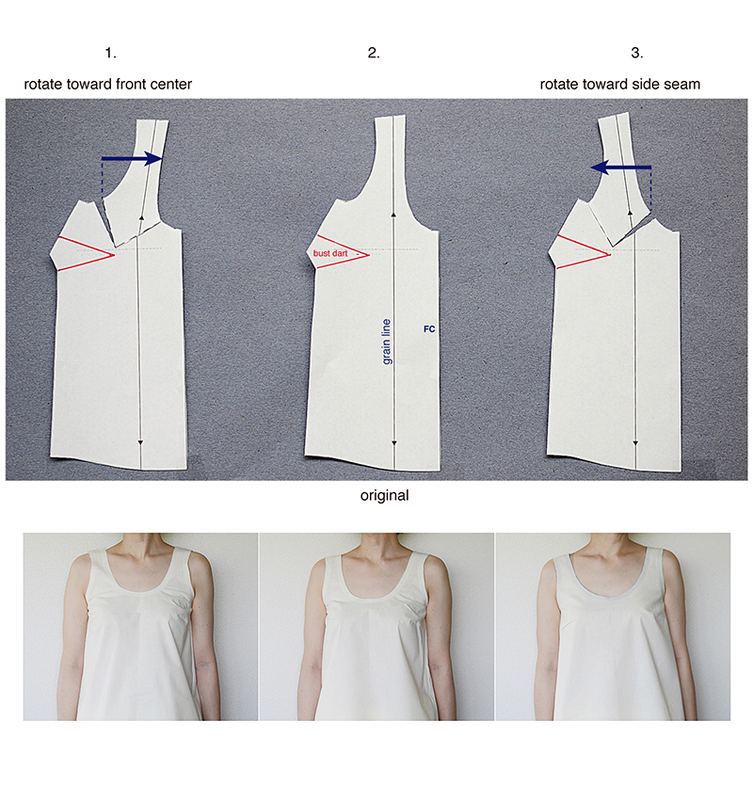 When the neckline was slightly shortened by moving the shoulder strap area toward FC(1), some severer creases at the interested area were observed (though it is not very well seen in this picture, sorry!) In contrast, and as you already guessed, when an extra 1.25cm of length to the (half) neckline(3), I got less and lighter creases at the area. Please note that lengthening the neckline by this method affected neck opening too much and caused partially revealing of the shoulder straps of my undergarment (which is not very good). And also note that the muslin(3) hangs rather baggy all over. I hope you can see the differences. 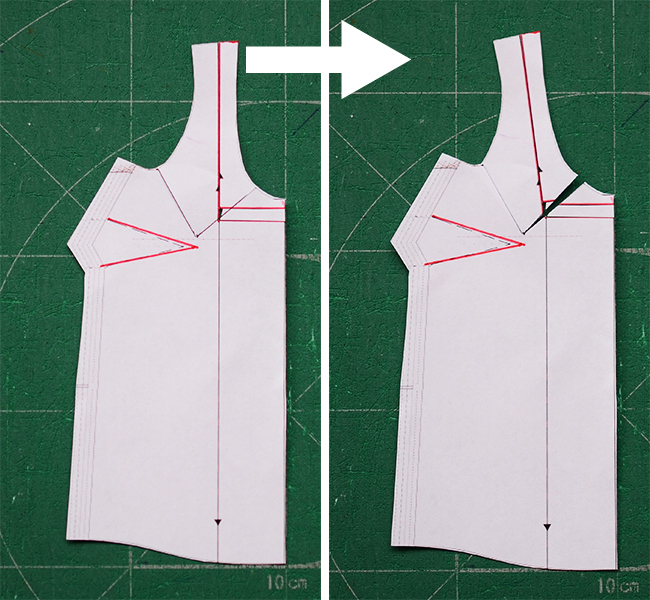 I separated neckline from the blouse and raised by 2cm by sliding the cut piece and then trimmed the excess part off the shoulder. made longer bust dart by just applying farther endpoint. 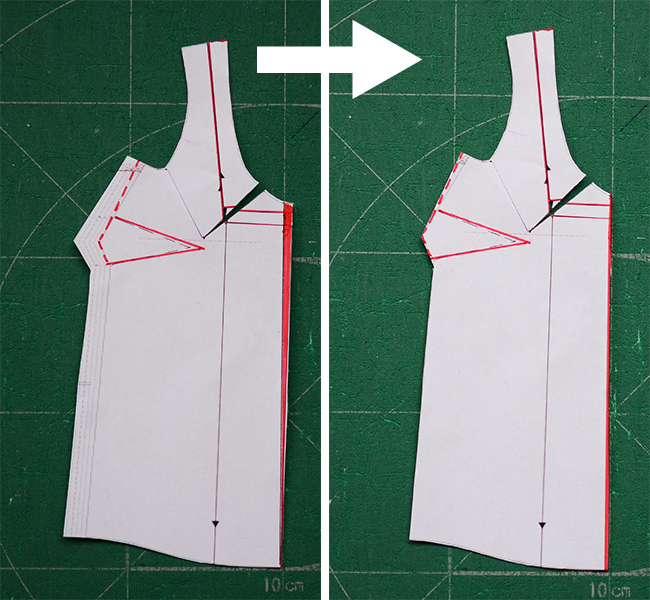 I moved the shoulder part toward the side seam by rotating separated shoulder part by about 1.25cm, as shown. 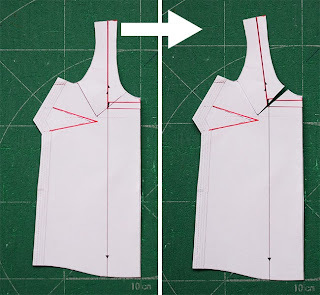 I trimmed away 1 ~ 1.25cm length of neckline from FC by removing the red area in the picture, and added some simlar length of armhole to underarm by simply extending the line at the side (dashed line in the picture). cut the side line nicely. smoothed the neckline and armhole carefully. 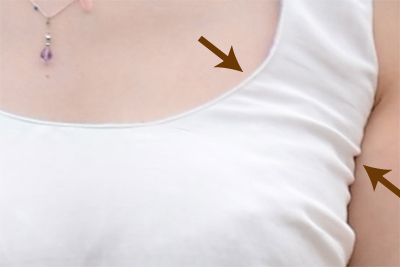 This step made my bra straps hidden and also decreased unwanted volume from the front body. I sewed a muslin. I saw several relaxed creases, but I was sure it would be fine in fashion fabrics. Sewed the cheerfully printed tank. I wish you a lovely Friday! I really love this fabric. It is pretty in real. I insist. Wonderful! Very helpful. Thank your for the explanations. Your top looks very nice. That is such a lovely top and the fabric looks wonderful. The top really suits you. Absolutely LOVE this tank! And you don't need to convince me how lovely the fabric is! You are inspiring me to look for something similar! I recently did a very similar adjustment to a sleeveless, scoop-necked sundress. I got the idea from someone's blog post (sorry, I've forgotten whose). That person got the "slash and remove the wedges" idea from Sarah Velben's alteration picture book. Love the tank and thanks for the pictures for the adjustments. Thank you for the clear instructions Yoshimi. The print of your top is beautifully displayed, as there are no creases. I adore your floral print, so perfect for summer. Thank you for the wonderful detailed information on your alterations. Seeing this kind of pattern manipulation is a good general education, even beyond the specific alterations. thanks for showing us the alterations! it goes to show that even a loose-fitting garment requires proper fitting! Wow, perfect timing! Just yesterday I was looking for a solution to this!! I am also wearing my tank today! Amazing. Thank you. Your top is beautiful! Also thanks for showing your fitting process, it's very interesting and helpful. 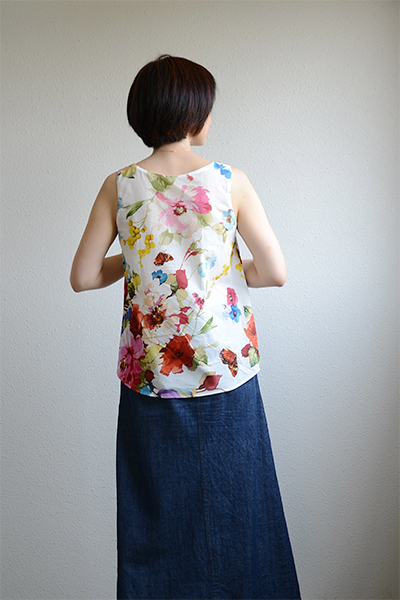 Gorgeous summer tank and thank you very much for sharing your changes. Love this outfit! Your tank has a gorgeous print, like a watercolour painting. Japan must be a fabric lovers' dream, your fabric choices are always so beautiul! It's beautiful and thanks for sharing your technique in fixing those wrinkles. That fabric is beautiful-is there an online source for it that'll deliver to Australia? Keeping my fingers crossed. Thank you theperfectnose! Sorry but I don't think they're selling these fabrics on line. I bought it at a local shop in Nippori fabric district in Tokyo some three months ago. By the way, as Nippori always has something that sewists covet, I totally recommend you to drop by whenever you can! Fantastic top and thank you for including your pattern adjustments. I was just about to cut out my second tiny pocket tank when I saw your post. I'm so pleased that I did. Turns out this is exactly the alteration I needed but I had no idea how to go about it before seeing your post. Thanks for generously sharing your knowledge. You're very welcome, Lisa! Good luck with your adjustments!